The winner of Elizabeth’s Blog Tour Book Giveaway has now been announced. To find out if you have won and how to claim your prize please click on the link to Dragonscale Clippings. I am sorry if you have been unlucky this time but remember you can always buy a copy direct from Silverburn Publishing. We are very sorry but the book giveaway has now ended. The winner will be announced soon. 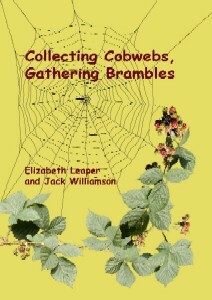 If you would like to buy a copy of ‘Collecting Cobwebs, Gathering Brambles’ you may do so at Silverburn Publishing. You can read sample poems by both Jack Williamson and Elizabeth Leaper at ‘By the Wobbly Dum-Dum Tree’ here. Only two days remain of my Blog Tour Giveaway. To be in with a chance to win a copy of ‘Collecting Cobwebs, Gathering Brambles’ visit Dragonscale Clippings here and leave a comment. You have until midnight on April 6th 2012 to do so. You can read sample poems by both Jack Williamson and Elizabeth Leaper at ‘By the Wobbly Dum-Dum Tree’ here. Today is book giveaway day at Dragonscale Clippings and it is the last day of Elizabeth Leaper’s week-long Blog Tour there. All you need to do to be in with a chance to win a copy of ‘Collecting Cobwebs, Gathering Brambles’ is to visit Dragonscale Clippings here and leave a comment. You have until midnight on April 6th 2012 to do so. You can read sample poems by both Jack Williamson and Elizabeth Leaper at ‘By the Wobbly Dum-Dum Tree’ here. AT LAST: Jack’s Poems are in print. Having wished for some time to see Jack’s poems in print I am pleased to announce the publication and launch of “Collecting Cobwebs, Gathering Brambles” on Saturday 17th September 2011 at Stafford Arts and Book Festival. We can all relate to the poems and verse by Elizabeth Leaper and her late uncle Jack Williamson that make up this collection. With their subject matter deeply rooted in a common heritage, sense of place, people and the natural world the two parts complement each other perfectly. Often amusing and sometimes poignant, this collection is above all thoroughly readable. The net profits from the sale of this book will be donated to charity.